This is, in many ways, the best Master System cover of all time. Sega sure had a thing for RoboCop, didn’t they? 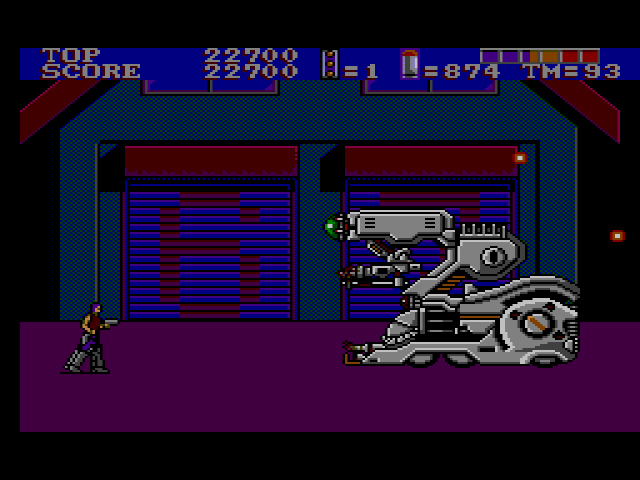 The Detroit cyborg cop has uncredited cameo appearances in Revenge of Shinobi, Mahjong Cop Ryuu, and Assault City. 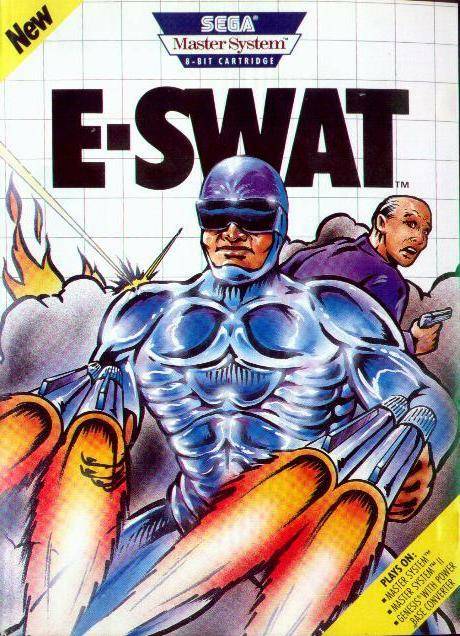 With E-SWAT, Sega makes their own unlicensed straight-to-VHS RoboCop ripoff. Unlike Alex Murphy’s cyborg uniform, Duke’s mech suit is bulky, goofy, and falls off the more he’s shot. Additional firepower and a longer lifebar are great, but it’s clear that the Liberty City Police Force needs to bump up their budget if they want to compete with the real thing. 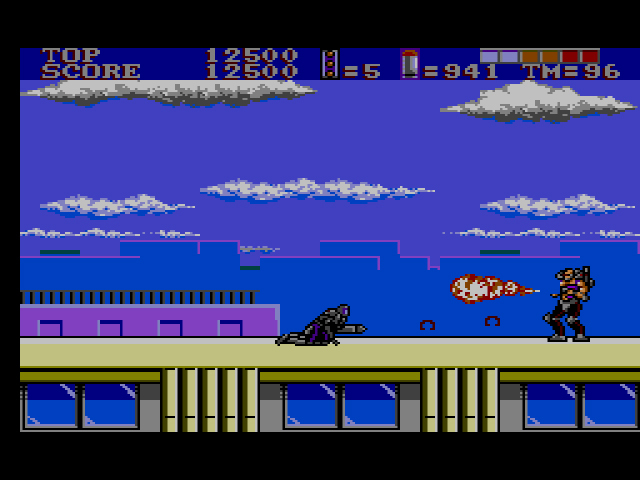 In the first stage, Duke’s in his civilian clothes, shooting at swarms of enemies coming from either direction. He can get shot four times and his pistol is slow compared to the enemies’ swift movement, but otherwise he gets along. After you beat the first stage, you’re promoted and given the mech suit. With it, you get a machine gun and you can get shot several more times. You also acquire limited special attacks like a Plasma Cannon or a Multi-Shot. These special attacks supposedly pack an additional punch, but they’re hard to pull off (buttons 1 and 2 at the same time, in theory) and they didn’t seem much more powerful than a traditional attack. The end is nigh for Spike and his old lady. In between each stage, you fight weird comic book type bosses. There’s the Fire Breathing Tub of Fat (actual name), the mohawked Boomerang dude, and an Axe Warrior straight out of “Mad Max,” among others. Their difficulty ranges from stupid easy to damn, son. Up until stage 3, I had no problems taking down each boss on my first try, but stage 3’s Giant Machine Gun stopped me in my tracks. This boss’s four cannons must be taken out one by one, and their all-at-once fire is nearly impossible to avoid without getting killed. I do believe Duke’s outgunned in this particular situation. E-SWAT‘s arcade big brother was never on the cutting edge of the run-and-gun genre, but this Master System port takes its design cues from 1986. The enemies that never stop coming remind me of awful early Master System brawlers, My Hero and Black Belt. 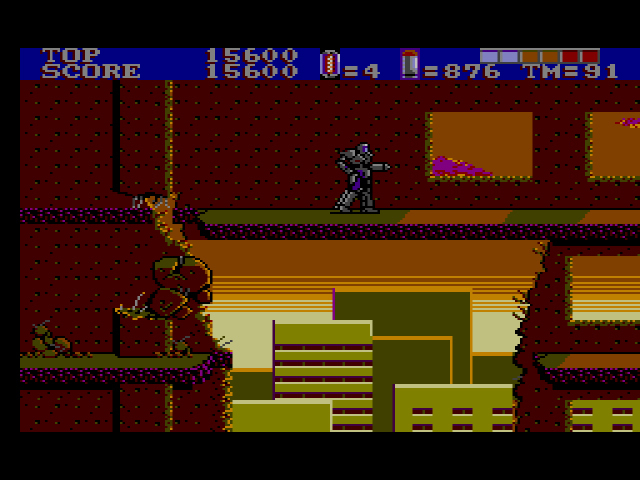 The stages are sparse and can be cleared quickly, particularly if you have the mech suit. Each enemy only takes one bullet to kill, and it’s incredibly easy to mow them down before they even get a shot in. While E-SWAT controls ok, the graphics are some of the worst I’ve seen on the system. Muddled colors and scratchy sprites remind me of some unlicensed Color Dreams mishap on NES, not a Sega arcade port by Sanritsu. E-SWAT is slightly more entertaining than Sanritsu’s previous Master System flop, Assault City, but both games share a malaise, as if they were assigned to the company against their will. Each game has a grim ugly aesthetic, abundance of killing, and stories that deal with the uncomfortable interlocking of robots and mankind against a dystopian background. No wonder Sanritsu was over it! Compare E-SWAT and Assault City with their wonderful, colorful golf game, Golfamania, and it’s clear where the company was most comfortable. This guy took over two hundred shots to kill. That is not a quip. In 1990, E-SWAT was a disappointment for those who held out hope that Sega would finally provide a decent arcade port for the Master System. Today, the game is a sad reminder that developers have to take jobs they don’t want in order to put food on the table. Don’t worry, Sanritsu: RoboCop doesn’t hold E-SWAT against you and neither do I. Better luck next time. Next Article What To Do With Our Friend, Sonic the Hedgehog? Good review! I didn’t think much of this when I played it, didn’t realise SEGA had farmed the port job out, I’d also never realised how bad the graphics were, your comparison to unlicensed NES is spot on. I think the main thing I’ve learnt on your journey so far is that the Master System’s arcade ports were actually pretty bad. Can’t wait for the review of Master System Alien Storm, it’s a game from my childhood I have pretty mixed feelings about…like to see your take on it…. Thanks! Yeah, Master System arcade ports are mostly trainwrecks. I’m very sorry to hear there’s more of them (Alien Storm). What a Robocop out! Haha! Sigh. That pun took me a second. Well done. I can really see your reviews evolving now Dylan. As your becoming more knowledgable in Sega lore you’re able to make references to past games and gaming focus (for example in this review you mention the Master System has had a bad run of arcade ports recently). I think this would only work by playing chronologically and being a mostly new comer to Sega (or any system for that matter). Brilliant writing, it always raises a smile when the latest Sega Does email drops into my inbox. Regarding the game. Completely agree. 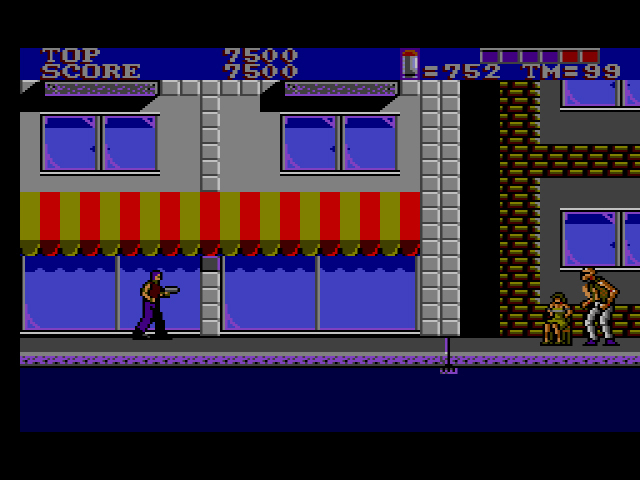 I enjoyed the coin op but it is an average game at best with a strange mix of Shinobi and Robocop. The Master System port is a bit of mess, not awful but should have been better. 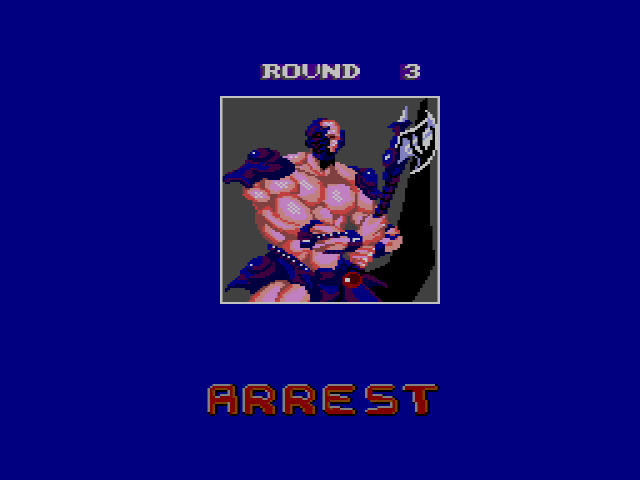 Thankfully the MegaDrive reimagining is a better game. Thanks so much, Sut! I’ve accumulated a ridiculous amount of knowledge thus far just by playing the games and drawing connections. ‘Course a little research helps too (thanks primarily to HG101 and SegaRetro). I loaned this game from a friend in 1991/92 because I was obsessed with playing someone else’s Megadrive version of Eswat, and as I only had a Master system at that time, this was the closest I was going to get on my console. Although I found it moderately enjoyable, I always saw this as a much less satisfying companion piece to the 16-bit version, although the fact that they were two different games was appealing at that time. Only later did I discover that this version was actually the one based on the arcade game. I found Eswat very easy to beat, and I found no problem completing it back then. But as i didn’t buy the game outright, I was quite happy to be able to finish it and give it back within a week or so. I like the fact that you can shoot diagonally up and to the left and right, but was often annoyed by the lack of consistency with the button controls when trying to pull off the special weapons move, especially when you need to use it to avoid being killed by a boss. I also found it odd to see a beleaguered Eswat walking around with normal clothes on the top half of his body but a mechanical pair of trousers on his lower half. Perhaps anticipating Wallace and Gromit, who knows?! Totally agree about the box art too; it’s one of the iconic Master System covers, and even Robocop was never THAT cool. I thought this was an odd, but kinda neat touch. Thanks for the comment, Johnny C! This is like the bizarre world of SMS games that I played in the arcade and Genesis but somehow were on this system too. Good to know I didn’t miss out on anything. I enjoyed the other two. Probrably the Mega Drive more so. The arcade game was pretty hard. I bought this about three months ago. I think there is some enjoyment to be had out of it although I will admit its flaws. That stage 3 boss is a first class b****** if you haven’t powered up enough to knock out most of his weapons when you start. The stage 2 boss is a bit infuriating at first too until you get used to which point you have to hit the fire button as you jump. I think D is fair.